The pioneering spirit of the Last Frontier brought homesteaders and gold miners to a place up North, far from the comforts of home and family, to discover new riches and adventures. That spirit continues to exist today and some of our favorite places to embrace it still feel largely untouched by the outside world. 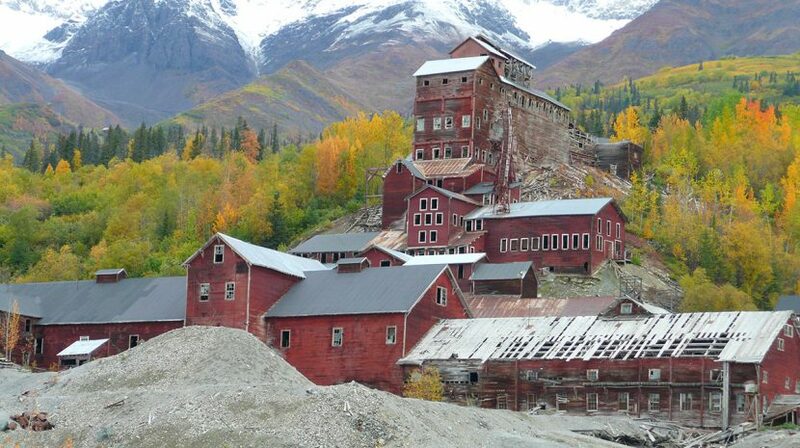 With abandoned mines to explore, visiting Kennecott Mines and McCarthy is like stepping back into time. Getting there is an adventure in itself; around a seven-hour drive from Anchorage takes you to the footbridge into McCarthy. The final two hours are by gravel road and cars aren’t allowed inside the town, so it’s best to park at the bridge and walk across. Alaska is full of gems like McCarthy, once boomtowns that are now a fascinating shadow of what they once were. Dyea, an important port town during the Gold Rush, was once home to more than 5,000 people, 47 restaurants, 39 saloons and 19 freighting companies. When Skagway won the race for a railroad, it beat out Dyea for long-term sustainability as the Gold Rush slowed. You can still visit Dyea and imagine the place it once was. As long as you’re in Southeast, plan a stop at Tenakee Springs, a town on Chichagof Island that is home to natural hot springs, salt and fresh-water fishing and miles of beautiful trails. Another gold mining town, Hope, is said to have been named for the youngest miner to try his luck, Percy Hope. Some of the town was lost after the 1964 earthquake, but the old Hope Social Hall survived and is still used today for community events and weddings. Hope is a place for adventurers, risk-takers and music lovers alike. In the summertime, you’ll find hiking trails up mountains and through passes; you can try your luck at gold panning in the 1.5-mile access area on Resurrection Creek that requires no permit. It’s the very place that the gold rush of that area began! Finish the day with an outdoor concert at the Seaview Café—music echoes through the town every weekend. If you’re lucky enough to get a campsite next door (you’ll have to beat out the locals) you can dance in the street and enjoy the music from your tailgate. Many people came to Alaska for gold but some came to homestead. Petersburg, Alaska’s little Norway, is a window into the hard work and dedication that built this state. Named after a Norwegian immigrant who arrived in 1890 and built a cannery, a sawmill and a dock, Petersburg quickly became a hub for Scandinavian immigrants. The cannery Peter Buschmann built has been in continuous use to this day. Now a major Alaska fishing community, there is plenty for visitors to enjoy, from wildlife viewing to fishing charters and Scandinavian charm. If wildlife is what you’re after, head to King Salmon, gateway to Katmai National Park, and one of the best areas for bear viewing in the entire world. King Salmon also offers opportunities to fly into fish camps and adventure lodges for a true, off-the-grid experience. Alaska is vast, filled with endless adventures and even those of us who have spent our whole lives here are still surprised by new discoveries.